You would have thought showing a little gray hair was a crime the way Demi Moore was chided by the Daily Mail today for not having her hair freshly dyed the same dark brunette we have become accustomed to seeing. The reporter made a word play of Demi’s 1990 movie, “Ghost,” by saying she must have “seen a ghost.” For crying out loud the movie “Ghost” was made 26 years ago and Demi, although still a very attractive woman today, has grown up and is, after all, 53. Reporter Mike Larkin tells us, “The ageing actress seemed to have finally got more than a few silver flecks in her hair as she enjoyed a meal at trendy Pinches Tacos in the trendy West Hollywood neighbourhood.” Is it really necessary to refer to Demi as the “ageing” actress? As a proponent of doing whatever you want with your hair, I found the whole article to be insulting. 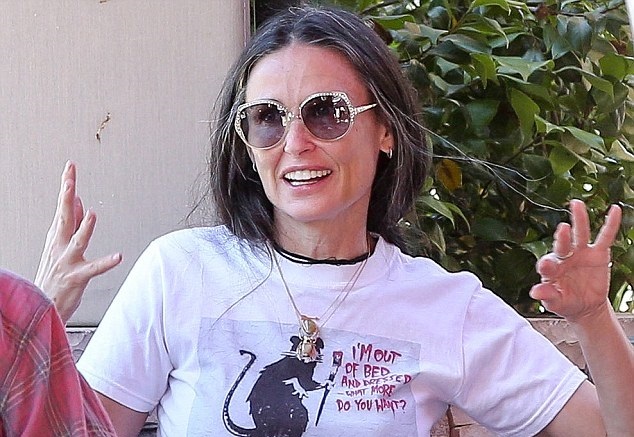 If anything, I would have been more mortified to be caught in public wearing a rat statement tee than with a few gray hairs. But alas, it is easy for nobody’s such as myself to throw stones at the rich and famous when, in Demi’s case, the camera is your livelihood and perhaps appearing to be as hip as possible is mandatory. Personally, I hope that Demi embraces her gray hair and aging body. Most of the women in my own generation are reluctant to admit that Father Time is still ticking and that despite Botox, rigorous gym workouts, and of course, hair dye, we are all getting older. You can’t remain a cougar forever and the question really is why would you want to? To grow, mature, and change is what makes life so interesting, and frankly, I never though Ashton Kutcher to be very interesting. I work at a hair salon but we also sell a lot of hair care products and hair dye and I have women come in every single day looking for a way to cover their graying hair. I think it’s such a shame because grey hair is not only natural but, if taken care of properly, can look absolutely gorgeous!